In another couple of days,the schools are closing down for summer vacations.Kids are all excited to blast however moms have to settle them tactfully and smartly.I know that many moms would have already enrolled them for some summer camps and activities.My kids love to refresh their time in the swimming pools,riding bikes and some indoor fun.They have already demanded many edibles too as part of their fun.Though am excited about summer vacations as to have lazy mornings but at the same time under pressure to handle them the whole day like teachers do at school.Anyways,every mom has to tackle this every year.Coming back to today's post is a pumpkin curry from God's own country,Kerala.This is an important dish especially in sadyas but I generally make it just like that as regular menu too.Traditionally,red oriental beans(vanpayaru) is used but I have used black eyed peas(lobia) to avoid the soaking part and this made it much more easier.i have already posted a mathanga curry post sometime back which is just made plain without any beans in it,check out if you are interested.Pumpkin adds a sweet touch to the curry,do give it a try !! Wash and pressure cook the black eyed peas in a cooker with enough water,turmeric powder and salt.Wait till 3 whistles on high heat and then switch off flame. Now,add the pumpkin pieces to the cooker once pressure is released and then check water if required(Pumpkin leaves out water when cooked so add just 1/4 water if required to cook the pumpkin). Pressure cook for 2 whistles and then switch off flame.In the mean time,grind coarsely the ingredients listed under 'to grind coarse' (without adding any water).Once the cooker is open,mash up the pumkin pieces using the back of the spoon or poato masher gently.now,add the mixture and bring this to a boil for 2 minutes.Switch off flame. Heat oil in another pan and add mustard seeds.When it splutters,add red dry chillies,sliced shallots and then finally add in grated coconut.Saute until the coconut gets roasted and a nice aroma spreads.Switch off the flame and pour this over the curry.Keep covered for 10 mins and then serve with steamed rice !! 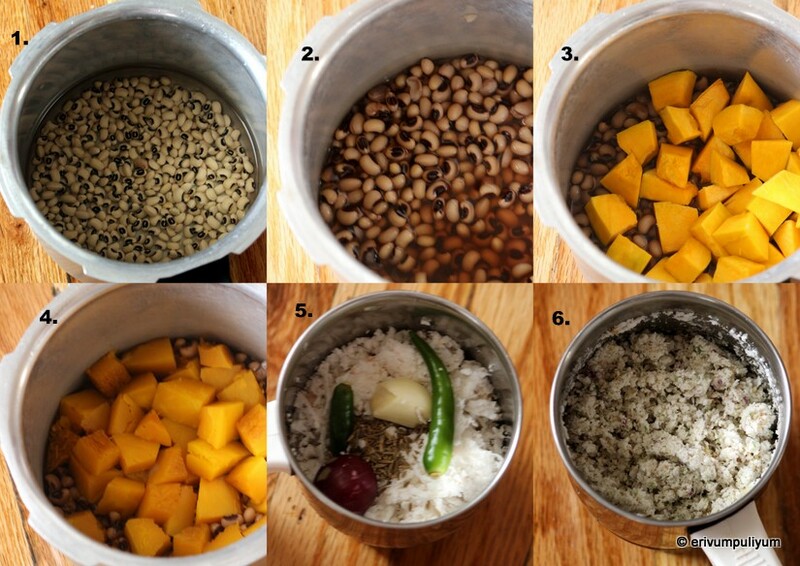 * You can use the same amount of red oriental beans (vanpayaru) instead of black eyed peas.In that case,soak the vanpayaru for about 6 hours or overnight in water.Then pressure cook for 3-4 whistles. * Use green chillies depending on spice tolerance.You can even add chilly powder instead of green chillies. * I have used green winter squash for this recipe. For all Kerala sadya recipes,click here. For us its more of a chaaru curry this one looks yumm the coconut will not be lost in the gravy I love that the most in the eriserry.